Anti-Bullying Week was started by the Anti-Bullying Alliance in the early 2000s as a way of focussing the attention of schools on tackling bullying between children and young people. The Anti-Bullying Alliance consults with its members and children and young people to decide the theme each Spring. This year the theme is Power for Good. The aim of the campaign is not just to raise awareness of bullying for one week each year but to support teachers in preventing and responding to bullying throughout the year. This year the Anti-bullying Alliance want every teacher, member of school staff and children's worker to know what a difference they make in children's lives. Children tell the ABA how much it means to them when teachers believe them, when they support them, and when they work with them to resolve bullying issues. 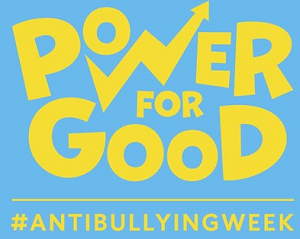 For the first time the ABA have launched a Power for Good Award to celebrate those teachers and school staff that go beyond the call of duty to provide pastoral care for pupils with issues relating to bullying. The ABA want to celebrate those teachers that are changing children's lives for the better and encourage all teachers and schools staff to use their Power for Good. 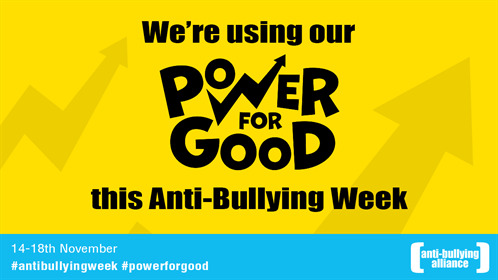 How can you get involved in Anti-Bullying Week 2016? Register for Anti-Bullying Week updates by joining the free ABA School or College Network. Download the Anti-Bullying Week logos and share on your websites and newsletters. Access the free Anti-Bullying Week resources including top tips. Join the Anti-Bullying Week social media campaign. Raise much needed funds for the work of the Anti-Bullying Alliance. E-safety Support members can download a free Cyber Bullying assembly from their E-safety Support dashboard. If you are not a member, join free here.